Last week I mentioned that I was working on a project using Crown bags…. today I get to show you the finished product! 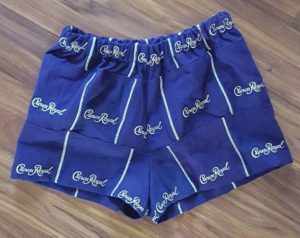 Taylor’s roommate asked if I could make her these to give to her fiance after he sent her a photo of shorts made of Crown Royal bags that he had found on the internet. Fortunately, she works at an Old Chicago and one of the bartenders had been keeping all the bags that they used so I had plenty to work with. I wound up making up piece of fabric from the fronts of 36 bags… basically I laid a seam front over top of an another front (with the seam trimmed off to reduce bulk) and stitched it in place to create a finished look. Once I had finished a “row” I created a finished (folded) edge and laid it on top of the previous row (I attempted to stagger it to, again, reduce bulk) and stitched it in place. 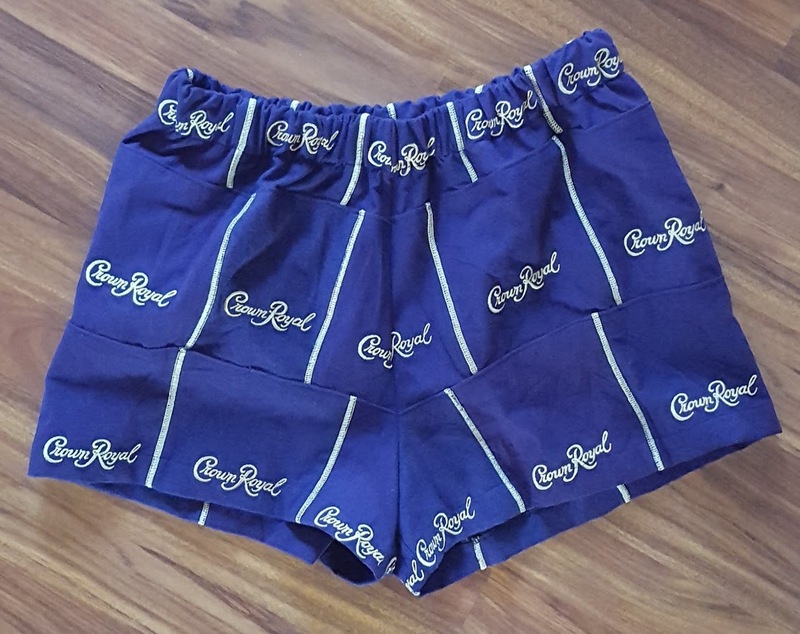 Once I was finished, I used the Walk the Plank Pajama Shorts (which is a free pattern for anyone that is interested) for the pattern and attempted to line everything up so the crown wasn’t cut off in too many areas. The actual sewing of the shorts went very quickly and are pretty straightforward. Since these are supposed to be a Christmas present, I have no idea how they fit, but they seem to have plenty of ease so I’m thinking they will be fine. So now a little bit of info about these shorts if you’re thinking of trying these for yourself. First off, get plenty of bags. I attempted to use the bare minimum (36 for a size medium in the Walk the Plank version), but you’ll definitely need more for larger sizes or depending on how your bag is created (I noticed that not all bags fronts are the same size – some are dramatically smaller than others)…. also be prepared for some carpel tunnel after all that cutting and trimming. Secondly, these shorts are not for people with a sensitivity to seams – there are seams all over this thing and as much as I tried to keep the bulk to a minimum it’s still there. Lastly, I recommend hand washing your finished shorts and definitely by themselves. The Crown Royal bags are made from felt and weren’t meant to be worn so I have no idea if they would shrink, distort, fall apart, bleed etc. in the wash… so don’t let all your hard work unravel and just slip them into the sink to soak. With all that said, these are pretty epic – I am sure they will be worn at the next collage party! This entry was posted in Uncategorized on December 18, 2017 by stacy.